Long distance train travel offers plenty of opportunity to meet people, and, as a writer, I’m always tempted to make notes of our conversations, especially if they’re revealing of character. As part of my series on the use of our senses in writing, I add the sense of listening — perhaps the seventh sense, the art of listening between the lines. 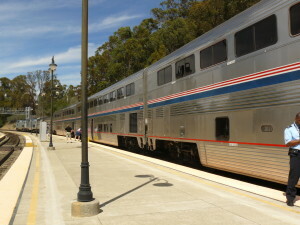 My first evening on the train, I was seated in the dining car across from a large man, who identified himself as a high school science teacher, and his slender wife. The inevitable question among strangers on a train is, “Where are you from?” When I answered Costa Rica, he looked a little glum and finally said, “I don’t know anything about Costa.” Then he turned to my seat mate and asked her what she did (the second inevitable question). She said she was a statistician. “I’m no expert on calculus, but I just read a very challenging book about it . . .” and he proceeded to tell her all about it. “I imagine you work mostly with existing formulas,” he prodded her. “No, I have to write quite a bit of code myself,” she answered. He was silently glum for another moment and then said his wife had had a gastric bypass. The statistician, shy and obese, said nothing. How do we create characters? I like to do it with conversation; people reveal themselves so quickly in their speech – their attitudes, their approach to others, their humility or arrogance, their desire to please or to show off. Physical descriptions often escape me when I’m so busy listening to what people say. And it’s not only what they say but how they say it that I find myself making notes about afterwards. In the snack bar this morning, I met a self-described “Christian Author” who was very happy to tell me at length about her literary career. She was a middle-aged woman wearing an unkempt blonde wig that was tilted just a little too far forward, so that the hair in back stuck out at a 45-degree angle. She said she had published a poem or two in some Christian magazines, but that her manuscript had so far been rejected by publishers. “Not at all,” I said, rolling up the remains of my trail mix and finishing off my tea. “We all have our own spiritual beliefs.” And then I escaped, but not without being blessed with her business card – from a real estate company. It’s difficult at times to keep your personal judgement sufficiently at bay so that the character you’re describing shines through on her own. But, of course, your own judgement is the lens through which you experience the world, so it’s important to err on the side of the Golden Writing Rule: show, don’t tell. My sense of irony, however, is always a little difficult to control. In the parlor car on the Amtrak Coast Starlight, they serve a light lunch, and it’s a pleasure to escape the hustle and crowding in the dining car. Here I met Alex, a robust man in a long-sleeved plaid shirt. We introduced ourselves as the train slowly wound through the magnificent pine-forested Cascades. His English was excellent, but I detected an Eastern European accent. He was Russian! I couldn’t believe my luck. “I am travel agent.” This gives Alex the chance to travel the world on an agent’s discount, and he’s taken advantage of it. We were just then passing a pristine river winding through a narrow alpine valley. He said, “This looks just like Siberia.” I snapped a photo. Capturing the style of speech – accent, grammar – is often overdone when painting a character with what comes out of his mouth. That can be distracting, so I tend to under-do it, which may not be enough! My last evening on the train, I was seated with Bill and Phyllis, a cheerful couple in their seventies, who had only been married for fifteen months. Bill asked his wife if she wanted butter with her roll, then grinned at me and said, “We’re still getting used to each other.” He had almost no chin, but an ear-to-ear smile. I guessed they had met at church, since Bill mentioned that his son and granddaughter and been to Nicaragua on a missionary school-building project. Phyllis asked me what I had ordered, apologizing for her macular degeneration. “I’m sorry, I can’t really see your meal from here,” she sighed. They had both ordered the “light entrée” – a flattened piece of chicken breast coated with an unidentifiable sauce and served over white rice. Phyllis took a couple of bites, then leaned into her new husband’s shoulder and asked, “Is this the chicken?” All of us laughed. No need for irony with Bill and Phyllis – just delight!